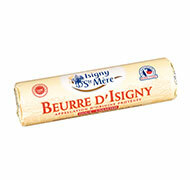 At Isigny Sainte-Mère we please lovers of butter. Rolls, blocks, shaped, made in churns or continuous process, meet our butter in all its many forms. 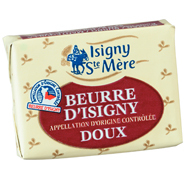 Our PDO Isigny Butter (Protected Denomination of Origin) is made in accordance with traditions, and exclusively from the milks of Isigny terroir. As specified in the AOP technical manual, nothing is added or taken away from the butter. 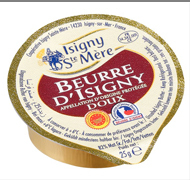 Made with the best traditional creams of Isigny (matured for 16 to 18 hours), it is famous for its golden buttercup colour and its distinctive notes of milk. 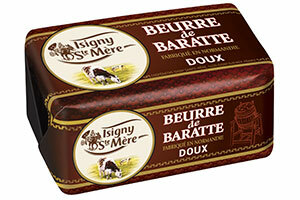 Our Churned butter is made exclusively from the best milks of the Isigny region. These milks, chosen for their exceptional richness in cream, protein and vitamins, are collected every 48 hours and brought to our reception tanks. Here they undergo a series of tests to ensure that they meet our highest quality standards. 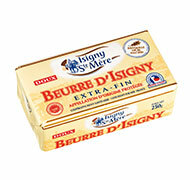 Only Isigny’s best creams are selected to be churned into Isigny AOP Butter. These creams acquire all their distinctive aromas and organoleptic qualities during one crucial stage: the traditional slow maturation. They are seeded with lactic starter cultures before resting for between 16 and 18 hours. After that, they are churned in the traditional way. 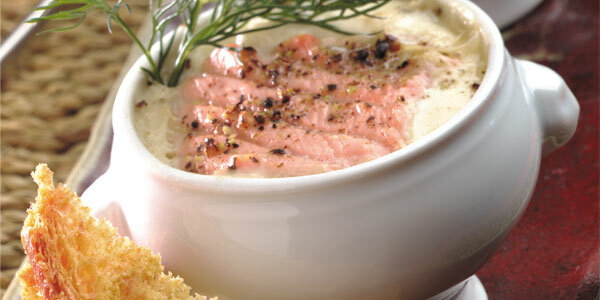 By respecting traditional methods, the grains of butter that form have an even melting texture. As specified in the AOP technical manual, nothing is added or taken away. 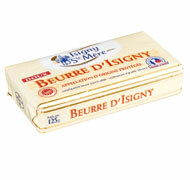 Isigny AOP butter is naturally rich in iodine, vitamin A and beta carotenoids. 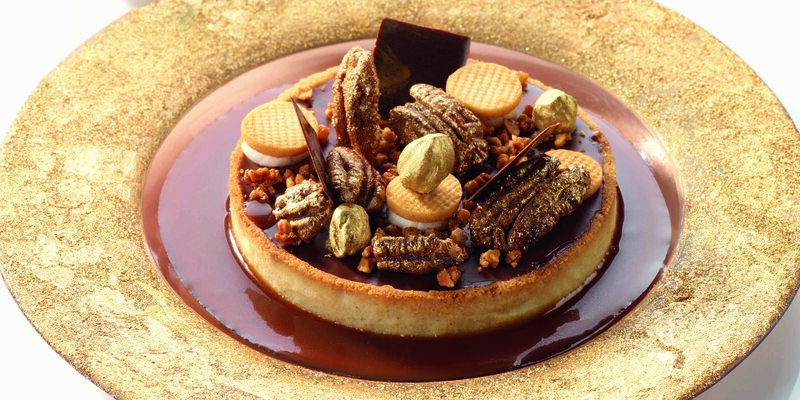 It is famous for its golden buttercup colour and its flavour, which has distinctive notes of hazelnut and milk. Our organic butter is made exclusively with milks from organic farms (AB certified). As well as coming with all the benefits of organic agriculture, they also have the natural richness of an exceptional terroir, the Isigny terroir. The milk is collected at 48-hour intervals and brought in to our reception tanks. Here, each tanker load of milk undergoes an initial series of tests to ensure they meet our demanding quality requirements. Our organic butter is churned using our best creams. These develop all their flavour notes and mouth feel during the most important process of all: the long, slow traditional ripening of the creams before churning. These creams are seeded with carefully selected lactic cultures and then rest for 16 to 18 hours. Then they are ready for churning in the traditional way, respecting the traditions of the region. 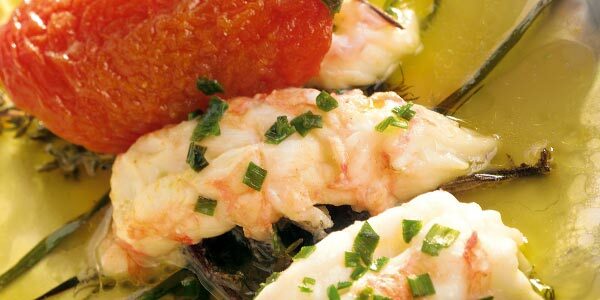 Our organic butter is naturally rich in iodine, vitamin A and beta carotenoids. 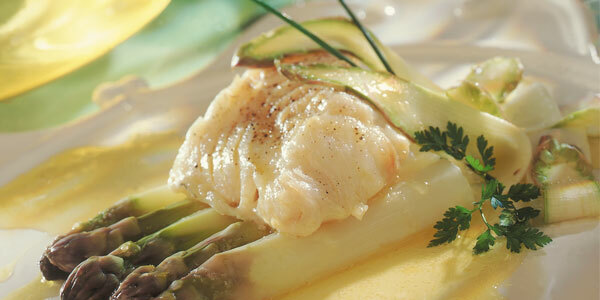 It is distinguished by its naturally smooth mouth feel, its melting texture and is very homogenous grain size. 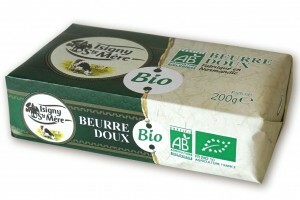 Unsalted organic butter, 200g pack.